What do we know about the Indian kings who presided over the Kerala temple where an extraordinary treasure trove has reportedly been found? The royal family of India's erstwhile southern kingdom of Travancore has a long history of resistance. A year before independence in 1947, the kingdom - one of more than 500 princely states - raised the banner of revolt and demanded freedom for itself. "Travancore will become an independent country," a feisty representative said in 1946. "There was no particular reason why we should be in a worse position than Denmark, Switzerland and Siam." It was no empty talk from a proud dynasty. They downed a Dutch fleet in 1741, a rare example of an Asian state inflicting a naval defeat on a European power. So, many are not surprised that existing members of the former royal family contested a petition of a devotee in the Supreme Court seeking a state takeover of the showpiece temple on the grounds that its controllers were incapable of protecting its riches. India's highest court ordered a count of the temple's wealth - and this has triggered off a tsunami of wild speculation. The media is awash with wildly speculative reports about the treasures buried in the temple's six underground vaults. They talk about "very old gold chains, diamonds and precious stones which cannot be valued in terms of money". One report talks of 450 golden pots, 2,000 rubies and jewel-studded crowns, 400 gold chairs and the statue of a deity studded with 1,000 diamonds. Apparently, all this amounted to 65 "treasure sacks" which could be worth some $20bn - more than India's annual education budget. The truth is that all of this is speculation, and the people who were sent to value the riches have been told to submit the inventory and its value to the court. A bit of drama accompanied the opening of the vault then. The rusting locks were broken after a two-and-a-half hour effort and an ambulance waited outside to attend to any "emergency". Floodlights and torches lit up the place, and fans pumped air into the vaults. Officials found "four chests made of brass which contained old coins"; a "granary-like thing" full of gold and silver coins; gold pots; and a six-chamber wooden chest full of diamonds, rubies, emeralds and other precious stones. They also found more than 300 gold pots. The 1931 report talks about four such cellars. Historians, like MG Sasibhooshan who has written a history of the temple, say it is no surprise that the Sree Padmanabhaswamy is a rich temple. Challenged by the missionaries, the dynasty opened a number of their own schools. The kingdom paid for the education of a poor Dalit [untouchable] boy called KR Narayanan and funded his scholarship to London School of Economics. Mr Narayanan became the first Dalit president of India in 1997. In 1956, royal family members invested in an English trading company and acquired it in 1971 when the English company divested its holdings. The family's links with Britain endure - historian MG Sasibhooshan says the company still supplies pepper to Buckingham Palace. 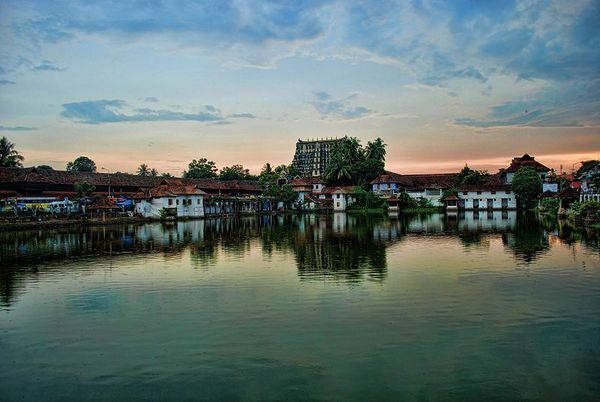 So who does the much talked-about treasure of Sree Padmanabhaswamy temple belong to? Many argue such wealth belongs to the people now and indeed all such wealth could be used for public good. 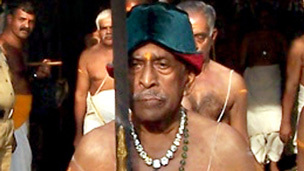 Kerala's chief minister has said the wealth belongs to the temple, something which many historians agree with. The temple, they say, is a private family property. There are still others who believe that the wealth comes under the purview of an antiquated colonial law called the Indian Treasure Trove Act, dating back to 1878, which says that when any treasure "exceeding in amount of value 10 rupees is found", the finder should inform the authorities, who in turn would try to trace its owners. So will the erstwhile rulers of Travancore retain their treasure they believe rightfully belongs to them? Thiruvananthapuram: Huge security had been lined up at Kerala's Padmanabhaswamy temple this morning for the much-anticipated opening of the secret "Vault B." However, at the last minute, the Supreme Court in Delhi postponed the procedure, because of conflicting views on whether the contents of the vault should be photographed. The court will discuss Vault B on July 14. The temple in Kerala's capital, Thiruvananthapuram, honours Lord Vishnu and has become world-famous in the last few weeks because of the jaw-dropping treasure that has been found in its secret chambers. Gold, silver, diamonds and other jewelry adding upto 1 lakh crores were found in five of the six vaults at the temple. Most of the valuables are believed to have been deposited by the Travancore royal family. The secret chambers are being opened under close supervision of retired judges and members of the temple trust after a local lawyer challenged the security and management of the temple. 24-hour security and a special police control room have been set up by the Kerala government to guard the temple. Earlier this week, the Supreme Court ordered that the treasure will be photographed and filmed, though the images are to be used for recording the valuables and not for public consumption. However, descendants of the royal family, some of who are trustees of the temple, are worried that filming the temple, and in particular the idols, violates religious sentiment and protocol. Sachin Tendulkar closer to get Bharat Ratna?